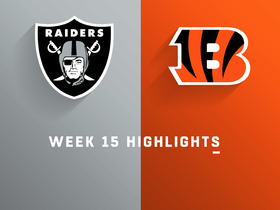 Mixon rushed 21 times for 123 yards and two touchdowns and brought in three of four targets for 15 yards in the Bengals' 37-34 win over the Buccaneers on Sunday. Mixon rushed 13 times for 50 yards and added three receptions for just one yard in Sunday's 45-10 loss to Kansas City. Analysis: Mixon nearly had the backfield to himself with Giovani Bernard (knee) still sidelined with an injury. The second-year back was unable to take advantage of the opportunity, averaging just 3.8 yards per carry before falling out of the gameplan due to game script. Mixon will look to bounce back in a soft matchup against the Buccaneers on Sunday. Mixon rushed 11 times for 64 yards and a touchdown while catching four of seven targets for 20 yards in Sunday's 28-21 loss to Pittsburgh. Analysis: Mixon gave his team a 21-20 lead with 1:18 remaining on a four-yard rushing score. Cincinnati likely regrets not giving Mixon more work, as he was extremely effective on a per-touch basis. Expect more opportunities for the workhorse running back against the vulnerable Chiefs defense in Week 7. Mixon (knee) rushed for 93 yards on 22 carries and caught three of four targets for 22 yards and a touchdown in Sunday's 27-17 win over Miami. Analysis: Mixon was the only Bengals running back to get a carry in this one, suggesting the team is comfortable giving him all the work he can handle. He made a terrific adjustment with the ball in the air to get in position for an 18-yard receiving score on the first play of the fourth quarter, propelling a 24-0 Cincinnati run to close out the game. Mixon will be an appealing Week 6 play against the Steelers. Mixon (knee) is in uniform Sunday against the Dolphins, Geoff Hobson of the Bengals' official site reports. 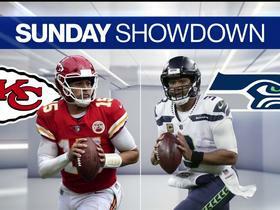 Although both Mark Walton and Thomas Rawls are active for Sunday's Week 5 tilt against the Dolphins, Mixon is still expected to see a solid workload in his return from a knee injury, Katherine Terrell of ESPN.com reports. Analysis: Rawls doesn't figure to be any serious threat to touches and is likely only active as an emergency option, while the rookie Walton only has four carries on the season. 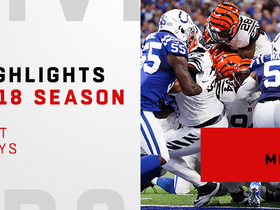 However, with Mixon seeing his first game action after missing the last pair of contests following arthroscopic knee surgery, it's not surprising Cincinnati will insulate themselves against a setback with a full complement of backs in the absence of Mixon's primary backup Giovani Bernard (knee). Though Mixon (knee) has been cleared to play Sunday against the Dolphins, coach Marvin Lewis said the 22-year-old could be eased into the backfield mix in his return from a two-game absence, Paul Dehner Jr. of The Cincinnati Enquirer reports. Mixon (knee) practiced fully Friday and doesn't carry an injury designation heading into Sunday's game against the Dolphins, Katherine Terrell of ESPN.com reports. 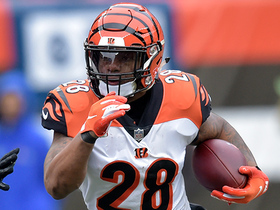 Analysis: Mixon's return to the mix couldn't come at a better time with Giovani Bernard (knee) having been ruled out for Week 5 after filling in for Mixon as the starter the past two games. With his health in order, Mixon is thus poised to head the Bengals' backfield this weekend, with Mark Walton on hand to serve in a backup capacity. The Bengals listed Mixon (knee) as a limited participant in Thursday's practice, Jay Morrison of The Athletic reports. Analysis: While Mixon's limited involvement represents no change from his activity Wednesday, the fact that he's merely on the field in any capacity on back-to-back days is an indication he's trending in the right direction as Sunday's game against the Dolphins approaches. With Mixon seemingly on pace to return from a two-game absence, he could be called upon to handle a large workload right away with change-of-pace back Giovani Bernard's (knee) availability looking dicey for the Week 5 matchup. Mixon (knee) was in uniform Thursday and taking part in the Bengals' practice, Katherine Terrell of ESPN.com reports. Coach Marvin Lewis hinted that he expects Mixon (knee) to return for Sunday's game against the Dolphins, Geoff Hobson of the Bengals' official website reports "The sun is up," Lewis said Wednesday. "It's a bright sunny day out there. Joe has worked hard." Mixon (knee) hasn't received clearance for the Bengals' Week 5 matchup with the Dolphins but said Wednesday that he would "for sure" play in the contest, Paul Dehner Jr. of The Cincinnati Enquirer reports. Analysis: While it can be taken as a positive that Mixon is optimistic about playing this weekend, he'll first need to prove his health by returning to the practice field. Since undergoing an arthroscopic procedure Sept. 15 to address a slight meniscus tear in his right knee, Mixon has yet to progress beyond working out on a side field. The Bengals will release their first practice report of Week 5 later Wednesday, which will offer a better gauge of where Mixon stands in his recovery. Coach Marvin Lewis said Monday that he isn't sure if Mixon (knee) will return Week 5 against Miami, Katherine Terrell of ESPN.com reports. Analysis: Mixon was ruled out Friday for Sunday's eventual 37-36 win over the Falcons, but he did take part in an on-field workout prior to the game. With Giovani Bernard (undisclosed) coming out of the contest a bit banged up, the Bengals could be more inclined to bring Mixon back Week 5. Mixon's Sept. 15 arthroscopic procedure came with an estimated recovery timeline of 2-to-4 weeks. Mixon (knee), who is inactive for Sunday's game contest against the Falcons, was taking part in an on-field workout prior to the game, Paul Dehner Jr. of The Cincinnati Enquirer reports. Analysis: Dehner relays that Mixon looked good during the session, offering an encouraging sign for the running back's prospects entering the Week 5 matchup with the Dolphins. The Bengals likely won't have a better read on Mixon's availability for next weekend until the team reconvenes for practice Wednesday. Mixon (knee) is officially out for Sunday's game against the Falcons, Geoff Hobson of the Bengals' official site reports. Analysis: As a result, Giovani Bernard will once again lead the Bengals' backfield Week 4, with Mark Walton on hand to serve in a backup capacity. Mixon has noted that his knee is feeling good these days, but it's still too early to know if a return to action Week 5 is in the cards for him. Though Mixon did not practice Thursday, he indicated that his knee "feels great" as he proceeds with running, cutting and conditioning, Fletcher Page of the Cincinnati Enquirer reports. Analysis: Expect the Bengals to confirm Mixon's out status for Week 4 on Friday's injury report, but the running back's progress is encouraging and opens the door to the possibility that he could play again as soon as the Bengals' Oct. 7 tilt against Miami. Mixon (knee) wasn't in uniform Thursday and won't participate in the Bengals' practice, Katherine Terrell of ESPN.com reports. He will continue to work out on the rehab field with the rest of the Bengals' injured players, according to Jay Morrison of The Athletic reports. Mixon (knee) was listed as a non-participant during Wednesday's practice, Geoff Hobson of the Bengals' official site reports. Mixon (knee) worked out on a side field at Friday's practice, Geoff Hobson of the Bengals' official site reports. Analysis: Less than a week removed from arthroscopic surgery on his right knee, Mixon followed up a workout in the weight room Wednesday with on-field work, albeit on the side, during Friday's practice. Among his activity, he was seen jogging through ropes with a football in hand, per Hobson. Mixon has a multi-week recovery in front of him, during which Giovani Bernard will serve as the Bengals' lead back. Meanwhile, Mark Walton is on hand to give Bernard the occasional breather. Mixon (knee) did some work in the weight room Wednesday, Geoff Hobson of the Bengals' official site reports. Mixon (knee) revealed Wednesday that his recent procedure addressed a slight meniscus tear, Katherine Terrell of ESPN.com reports. Analysis: On the plus side, the running back indicates that his right knee is already feeling better, and though he's destined to miss Sunday's game against the Panthers, his absence shouldn't be an extended one. While Mixon is sidelined in Week 3, Giovani Bernard is in line to head the Bengals' backfield, per Geoff Hobson of the team's official site. Additionally, look for rookie Mark Walton and new signee Thomas Rawls to be eased into the mix this weekend. Saturday's procedure to remove a small particle from Mixon's knee reportedly went well, according to Katherine Terrell of ESPN.com. Analysis: While a specific timetable has yet to be confirmed by the team, initial reports suggested a two-week recovery period for Mixon. With that in mind, Giovani Bernard is in line to see added work in the Bengals' backfield, beginning Sunday against the Panthers. Tra Carson and Mark Walton are also on hand for backup/complementary duty. Mixon (knee) underwent successful arthroscopic surgery Saturday and is expected to be sidelined for 2-4 weeks, Ian Rapoport of NFL Network reports. Analysis: The extra time between games will benefit Mixon's recovery timeframe, but he is still likely to miss at least one game. 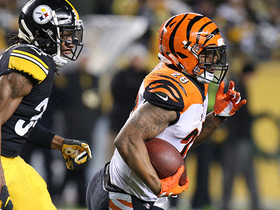 The second-year running back was clearly playing through pain in the second half of Thursday's 34-23 victory over the Ravens, so he and the Bengals opted for the surgery route in order to get ahead of the curve and avoid a lingering issue. Giovani Bernard figures to be primed for a large workload in the immediate future while MIxon is sidelined. Mixon (knee) is scheduled for a minor surgical procedure this weekend, with an estimated recovery timeline of two weeks, Jason La Canfora of CBS Sports reports. Analysis: Mixon was clearly playing through pain in the second half of Thursday's 34-23 win over the Ravens, though the injury wasn't enough to prevent him from taking 21 carries. He reportedly had a small particle in his knee dislodged at some point during the contest and will now have a minor procedure to clean things up. Giovani Bernard is primed for a large workload Week 3 in Carolina and quite possibly again Week 4 in Atlanta. The Bengals fear that Mixon will need an arthroscopic procedure to address his knee issue, Tom Pelissero of NFL.com reports. Analysis: Mixon will get a second opinion, but it looks as though he could miss some time. In such a scenario, Giovani Bernard would see an expanded workload in the Bengals' backfield. When asked about his injured knee Friday by Katherine Terrell of ESPN.com, Mixon said, "It felt weird. My knee was hurting. Other than that, it's just the mental side of it. You always want to play at 100 percent, but when something is bothering you it's hard mentally. I just had to check back in mentally and physically tough it out." Mixon rushed 21 times for 84 yards and secured his only target for three yards in the Bengals' 34-23 win over the Ravens on Thursday. Analysis: Mixon managed to put together a second solid effort in as many games despite missing time during the contest with a knee injury. After logging a modest 17 rushing touches in the opener against the Colts, it was encouraging to see the promising second-year back cross the 20-threshold in carries despite the time he spent on the sideline, even as he was minimally involved in the passing game. Mixon will look to extend the impressive start to his season against the Panthers in Week 3. Mixon (knee) returned to Thursday's game after being sidelined with a right knee injury earlier in the game, Jay Morrison of The Athletic reports. Analysis: Mixon ripped off a 21-yard run shortly after returning to the field, suggesting that his injury is not a serious one. The second-year running back and Giovani Bernard may split work more than they normally would for the remainder of Thursday's contest depending on how Mixon's knee is feeling. Mixon is questionable to return to Thursday's game with a right knee injury. Analysis: Mixon exited the game in the first half due to a knee issue but promptly returned. If he is unable to get back on the field this time around, Giovani Bernard figures to feature as the Bengals' three-down back for the remainder of Thursday's contest. Mixon went to the locker room in the first quarter of Thursday night's game to get his right knee checked out, Paul Dehner Jr. of The Cincinnati Enquirer reports. 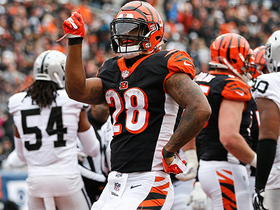 Analysis: Mixon sat out the third series for the Bengals in favor of Giovani Bernard, but returned on the subsequent series. Mixon rushed 17 times for 95 yards and a touchdown while adding five catches for 54 yards on seven targets in Sunday's season-opening 34-23 win over Indianapolis. Analysis: Mixon had a quiet preseason, but the second-year running back elevated his game for the regular season. Third-down back Giovani Bernard had just one target and one rushing attempt, suggesting Mixon is primed to be more of a bell cow than most anticipated heading into the year. Mixon's one-yard touchdown in the fourth quarter gave his team a 24-23 lead that it would never relinquish. Mixon rushed six times for seven yards and caught one of two targets for 23 yards in Sunday's 26-13 preseason win over the Bills. Analysis: Mixon didn't get much going against the Buffalo front, though he did make a nice play in the passing game. The second-year man out of Oklahoma has the skills to play a three-down role, but he'll likely cede some passing-down snaps to Giovani Bernard when the regular season kicks off Sept. 9 in Indianapolis. Mixon gained eight yards on four carries and caught his only target for a one-yard gain during Saturday's 21-13 preseason win over the Cowboys. Mixon (undisclosed) was on the field for the first running play of the day at Thursday's practice, Paul Dehner Jr. of The Cincinnati Enquirer reports. Analysis: Mixon left Wednesday's practice early, but his return to the field in such short order confirms that the issue that caused his exit was a minor one. With Jeremy Hill no longer around, a healthy Mixon is on track to head the Bengals' backfield this season. It's less certain how many snaps he might cede to Giovani Beranrd, who is on hand to reprise his change-of-pace/pass-catching role for the team. Mixon left Wednesday's practice early due to an undisclosed issue, Katherine Terrell of ESPN.com reports. Analysis: Per the report, as Mixon left the field, he "was walking slowly, but he wasn't limping or anything." The Bengals should soon issue another update indicating whether the running back is dealing with an injury or something more harmless, such as cramping. Mixon is down to 218 pounds, Geoff Hobson of the Bengals' official website reports. Mixon has toned his physique, reporting to the offseason program about 225 pounds, per Geoff Hobson of the Bengals' official site. Bengals player personnel director Duke Tobin said Wednesday that Mixon will act as the team's lead runner in 2018 and will be relied upon heavily, Katherine Terrell of ESPN.com reports. "Joe really came on for us in the later part of the [past] year, second half of the season. He's going to be our bell-cow running back," Tobin said. "We are going to combine him with [Giovani Bernard] and we really feel good about that position group." Mixon rushed 18 times for 96 yards and caught his lone target for one yard in Sunday's 31-27 win over the Ravens. Analysis: Mixon was rolling in the first half with 14 carries for 77 yards, but he also lost a second quarter fumble. 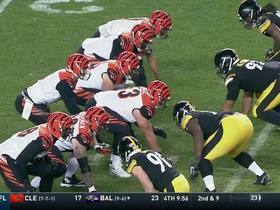 The Bengals offense stalled for much of the second half until their game-winning drive in the game's final minute, which the rookie watched from the sideline. The 96 rushing yards are Mixon's second-highest total of the season, and allow him to finish on a high note after dealing with a concussion and ankle injury in December. Mixon (ankle) is listed as active for Sunday's matchup against the Ravens. Analysis: Despite missing plenty of practice time this week, Mixon tested his ailing ankle on the field during pregame warmups, and the results were favorable enough to allow the back to suit up. Though Mixon has had some productive fantasy games in the second half of the season, he's a risky fantasy play given the fact that he may not be 100 percent, as well as the fact that Giovani Bernard has been highly productive in his stead. Look for some type of timeshare between the two backs. Updating a previous report, Mixon (ankle) is expected to play Sunday against the Ravens unless he experiences a setback during pregame warmups, Katherine Terrell of ESPN.com reports. Mixon plans to test out his injured ankle during pregame warmups, but the Bengals aren't expected to make him active for Sunday's game against the Ravens, a source informed Ian Rapoport of NFL Network reports. 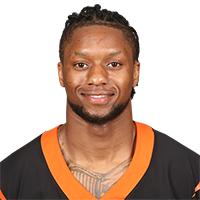 Mixon (ankle) is listed as questionable for Sunday's game against the Ravens, Geoff Hobson of the Bengals' official site reports. Mixon (ankle) returned to a limited practice Thursday. Analysis: Fellow running back Giovani Bernard (ankle) -- who ran for 116 yards and a TD and caught seven passes for 52 yards in Week 16 -- was also limited Thursday, in his case for the second day in a row. Both players appear on track to play Sunday against the Ravens, barring any setbacks, though Mixon could well end up listed as questionable for the contest. Mixon (ankle) isn't practicing Wednesday, Jim Owczarski of The Cincinnati Enquirer reports. Mixon injured his left ankle and is considered questionable to return to Sunday's game against the Lions. Analysis: Mixon went down midway through the first quarter after gaining 32 yards of total offense. In his absence, the Bengals will presumably turn to Giovani Bernard as their featured runner. Mixon (concussion) does not carry an injury designation for Sunday's game against the Lions. Analysis: Mixon practiced fully all week and with no injury designation attached to his Week 16 status, he's on track to be back in the lineup this weekend. Prior to being forced out of action early in Week 13, Mixon had hit the 20-carry mark in back-to-back outings. In his return to action Sunday, look for him to reclaim the Bengals' lead back role, with Giovani Bernard thus ticketed for change-of-pace duty in the Bengals offense. Mixon (concussion) put in a full practice Thursday, Jay Morrison of the Dayton Daily News reports. Mixon (concussion) practiced fully Wednesday, Paul Dehner Jr. of The Cincinnati Enquirer reports. Analysis: Mixon also practiced fully last Friday before being ruled out for Week 15's loss to the Vikings, so we won't assume that he's cleared the NFL's concussion protocol just yet. That said, Mixon's continued full participation does bode well for his chances of returning to action Sunday against the Lions. The Bengals have downgraded Mixon (concussion) to out for Sunday's game against the Vikings, Geoff Hobson of the Bengals' official site reports. Analysis: The Bengals were clearly anticipating this designation, as they promoted fellow rookie running back Jarveon Williams from the practice squad earlier in the day. Mixon's absence will mark his second straight, while he remains in concussion protocol. As a result, Giovani Bernard will presumably continue seeing the majority of the work in the Bengals' backfield, while Brian Hill and the aforementioned Williams could also see some run. Mixon (concussion) practiced fully Friday and is listed as questionable for Sunday's game against the Vikings. Mixon (concussion) practiced in a limited fashion Thursday, Geoff Hobson of the Bengals' official site reports. Analysis: While added context is required to get a better read regarding how close Mixon is to being medically cleared in advance of Sunday's game against the Vikings, his limited practice participation Sunday is nonetheless a positive indicator with regard to his Week 15 availability. Mixon (concussion) was spotted at practice Thursday, Jim Owczarski of The Cincinnati Enquirer reports. Analysis: After not practicing Wednesday, Mixon was sporting his helmet and jersey at Thursday's session, which represents a step in the right direction for the running back as Sunday's game against the Vikings approaches. We'll circle back on Mixon's status later Thursday to see how the Bengals list his level of practice participation. Mixon (concussion) remains in the NFL's concussion protocol and isn't taking part in practice Wednesday, Jim Owczarski of The Cincinnati Enquirer reports. Mixon remains in the concussion protocol Wednesday, Paul Dehner Jr. of The Cincinnati Enquirer reports, but he appears to be making progress, according to Jim Owczarski of The Cincinnati Enquirer. Analysis: With Mixon still in the concussion protocol, it shouldn't be a surprise if he sits out practice Wednesday. In any event, if the report that he's progressing is true, it bodes well for Mixon's chances of getting back on the field Sunday against the Vikings. Mixon still has several days to clear the protocol, but he will ultimately have to do so in order to play in Week 15. Mixon (concussion), who did not practice this past week and was inactive Sunday, will look to gain medical clearance to play in advance of the Bengals' Week 15 road game against the Vikings. Analysis: In Mixon's absence, Giovani Bernard headed Cincinnati's Week 14 backfield, carrying 11 times for 62 yards and hauling in six passes for 68 yards, while backup Brian Hill logged two carries and one catch. Prior to exiting this past Monday's loss to the Steelers, Mixon parlayed his 17 snaps into seven carries for 34 yards and one catch for eight yards. Mixon (concussion) has been ruled out for Sunday's game against the Bears, Katherine Terrell of ESPN.com reports. 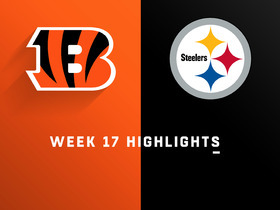 Analysis: Mixon missed the entire week of practice after suffering a concussion in the first half of Monday's 23-20 loss to the Steelers. His absence sets up Giovani Bernard for a workhorse role in Week 14, with rookie fifth-round pick Brian Hill representing the only other healthy tailback on the roster. The Bengals likely will sign another running back before Sunday to offer depth behind Bernard and Hill, potentially turning to Jarveon Williams from their practice squad. Mixon (concussion) isn't taking part in practice Thursday, Jay Morrison of the Dayton Daily News reports. Mixon (concussion) isn't present for Wednesday's practice, Katherine Terrell of ESPN.com reports. Mixon (concussion) has been ruled out of the remainder of Monday night's game against the Steelers. Analysis: Mixon's night ends with seven rushes for 34 yards and one catch for eight yards. His absence leaves Giovani Bernard to shoulder the Bengals' backfield duties, as Brian Hill is their only other running back available. Mixon will need to clear concussion protocol in order to play in Week 14 against the Bears. Mixon exited Monday night's game against the Steelers to be evaluated for head and shoulder injuries, leaving him questionable to return. Analysis: Mixon went down after taking a hit during the second quarter. If he's unable to return, Giovani Bernard would figure to see the vast majority of Cincinnati's backfield snaps, as recently signed rookie Brian Hill is the team's only other active tailback. Prior to exiting, Mixon rushed seven times for 34 yards and caught his lone target for eight yards. Mixon rushed 23 times for 114 yards and a touchdown in Sunday's 30-16 win over the Browns. He also reeled in all three passes directed his way for 51 yards. 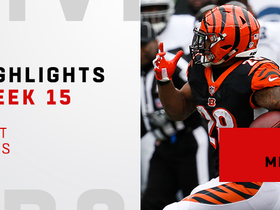 Analysis: Mixon had gains of nine and 19 yards on the Bengals' opening drive and seemingly made chunk plays at will in the contest, including three of 11 or more yards on the drive that culminated in his touchdown run. It was seemingly just a matter of time before the rookie would break out, as he has now run the ball more than 20 times in back-to-back games. He has another stiff test against Pittsburgh in Week 13. Mixon carried 20 times for 49 yards and caught two passes for no gain during Sunday's 20-17 win over the Broncos. Analysis: Mixon received 20 carries for the first time in his young career as his team looked to milk a lead, but he managed just 2.5 yards per carry and had a long gain of eight. On a positive note, Giovani Bernard received just four touches in this one, meaning the rookie's usage should remain high moving forward. Still, his 2.9 yards per carry on the season indicate he's yet to make the most of his opportunities -- a trend he'll look to buck next week against the Browns. Mixon rushed nine times for 37 yards and a touchdown while adding a three-yard catch on three targets in Sunday's 24-20 loss to the Titans. Analysis: Mixon found paydirt for the second consecutive week, scoring from three yards out in the second quarter to capitalize on a Marcus Mariota interception. All three of Mixon's touchdowns have come in the past five games, but the rookie second-rounder is averaging just 3.0 yards per carry and has rushed for more than 51 yards only once in his young career. Mixon rushed for 31 yards and a touchdown on 13 carries and added 15 yards on three catches in Sunday's 23-7 loss to the Jaguars. Mixon will start at running back Sunday against the Jaguars with Jeremy Hill (ankle) inactive for the contest, Paul Dehner Jr. of The Cincinnati Enquirer reports. 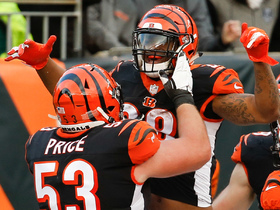 Analysis: Hill had logged exactly four carries in each of the Bengals' last three games, so he was a de facto starter more than anything with head coach Marvin Lewis having committed to Mixon as the team's feature back. Nonetheless, Hill's absence will allow Mixon to enter the game for the Bengals' opening drive and could result in a couple extra touches for the rookie over the course of the day, thereby enhancing his fantasy outlook for the week.